Liam’s close up shows are ideal for cocktail parties, pre or post dinner drinks, product launches, weddings, corporate events, private parties or almost anywhere that entertainment is required. Liam performs close up magic to small groups of guests. 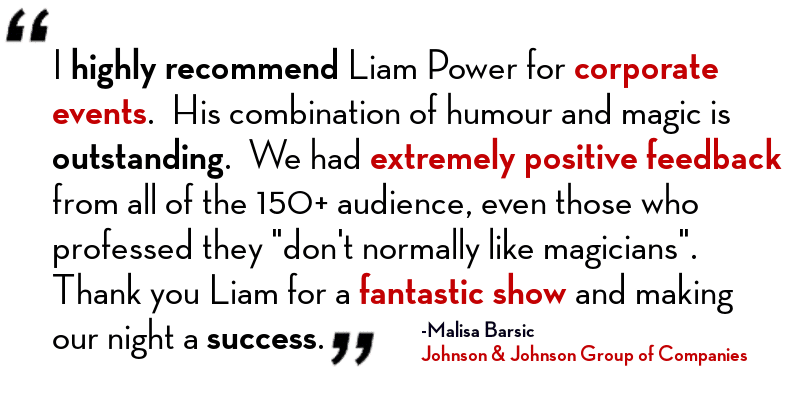 As he moves around your event Liam will have your guests actively involved in tricks, laughing, chatting and being amazed. It is a very intimate performance style and is the perfect ice-breaker. Liam’s close up performances are interactive, high energy and naturally create talk, excitement and atmosphere. Liam has been performing on stage in his unique laid back style for over 15 years. He's performed in the huge theatres of luxury cruise ships, on the largest stages or national festivals, presented at TEDx and at corporate events for large multi-national companies. Liam's stage performances can last from 10 minutes to one hour. His shows can be anything from a stand alone magic show to a quick session to keep your guests entertained between speakers. The show is always fast-paced, interactive and funny.